Is there any better smoothie ingredient than berries? Blackberries, blueberries, raspberries, strawberries, goji berries, mulberries…oh how I love thee! Not only do the various berries taste great, they pack a hefty nutritional punch. Unlike higher sugar content fruit, you really can’t over do it with low glycemic berries, which are universally accepted by pretty much every type of diet out there. Antioxidant Assault: The dark pigment (anthocyanins) that gives berries their color is loaded with antioxidants that benefit your entire body. Brain Berries: Blueberries have been shown to improve cognition. Odds are blackberries contain some of the same brain supporting compounds. Cardiovascular Health: Help strengthen blood vessels and support healthy cholesterol levels. Improve Eyesight: Prevent age-related degeneration and support eye health by reducing oxidative stress. Anti-Cancer: Help prevent many types of cancer mainly through antioxidant free radical quenching. Blood Sugar: Berries are low glycemic and therefore won’t spike blood sugar. Nutrient Dense: Loaded with important vitamins and minerals. For more information on the health benefits of each: blueberry health benefits and blackberry health benefits. 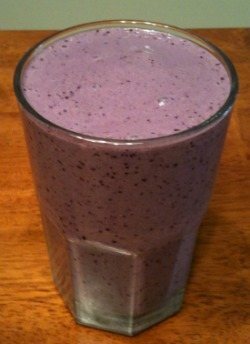 I usually purchase my berries in bulk, preferably from local and organic sources, and freeze them for use in my smoothies for several months. Because of their thin skin, you want to stick to organic berries whenever possible. This smoothie makes for a healthy desert. Maybe decorate with cacao nibs and/or bee pollen. Enjoy! Let me know what you think of this decadent black and blue smoothie by leaving a comment below. Happy Blending!